Action Wildlife Removal has a team of wildlife specialists in Guelph dedicated to making sure that you get to enjoy wildlife from a distance and that wildlife can’t invade your home or office or damage your property in any way. We are animal lovers and do everything to preserve nature and professionally help clients deal with their wild animal problems. At Action Wildlife Removal Services we are committed to safely, effectively and humanely remove nuisance wildlife through exclusion and control services. If a wild animal is giving you problems at your home or office, we can help. Evaluate and inspect your property for the wildlife’s point of entry: Where is the wild animal? How is it managing to get into your property? Call us at 647-700-4948 and arrange an in-house inspection. Why Choose Action Wildlife Removal for Your Wildlife Control Issues? 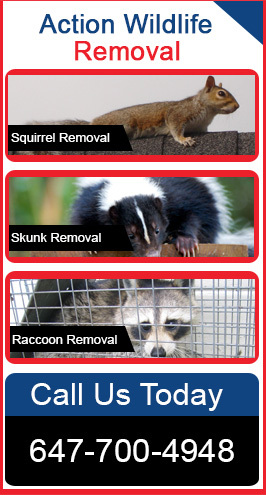 So, let’s be honest, there are plenty of wildlife removal companies in Guelph, so why choose Action Wildlife Removal? Well, there isn’t just one good reason so we will go ahead and offer a little bit of insight into who we are and what exactly we do. Honesty: Our technicians will never exaggerate health risks or use scare tactics to sell you the services you don’t require. We will simply educate you what exactly is going on in your property and what exactly we need to do to take care of the issue from eviction to remediation. Professionalism: We strive to make your experience highly professional and one that stands out among the rest. Our friendly and courteous wildlife technicians will always arrive on time, wearing company uniforms so that you know exactly who is on your property. Quality: We pride ourselves on the quality of our service and the quality of the products we use. It is our goal to create a quality of service as a by-product of the professionalism and honesty that we bring to each and every job. Contact our experts today to handle your wildlife removal needs.